Launda and friend examining an installation in the art gallery next to the theater before the show. 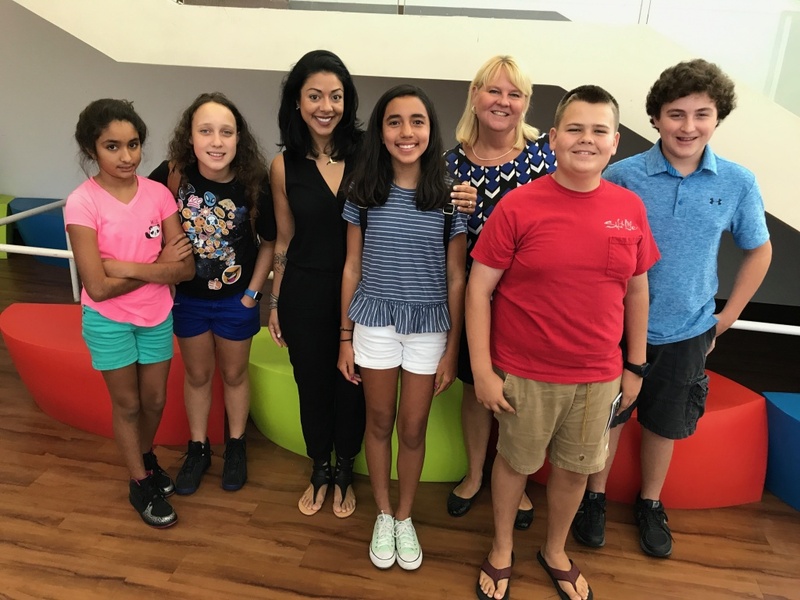 The first Drama Club field trip of the summer of 2017 was the attending of an amazing production of the musical “Into the Woods” at Florida Atlantic University’s Studio One Theater during their summer “Festival Rep”. The play was at 2 pm on Saturday, July 15, 2017 and was well worth the effort! 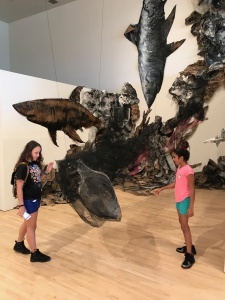 Before the play, students got to see an art gallery where they saw some fun contemporary art. The Studio One theater seats less than 200 people so there are really no bad seats in the house. Some of the drama students got front row seats and literally were a few feet away from actors at times. That was a real treat! The theater was pretty much sold out and an actor introduced the the festival, the musical, and what was going to happen. Being a small theater, actors extensively used the isles to leave stage front so everyone stayed out of the aisles. And that was a good thing: the actors often ran at full speed down the aisles and out the back of the theater. This was the first time many of us saw wireless mics worn in the middle of the forehead. The wire comes from the back, through the hair, and then down to the middle of the forehead. Very interesting! They seemed to pick up the sound but not quite as good as side-mouth mics. 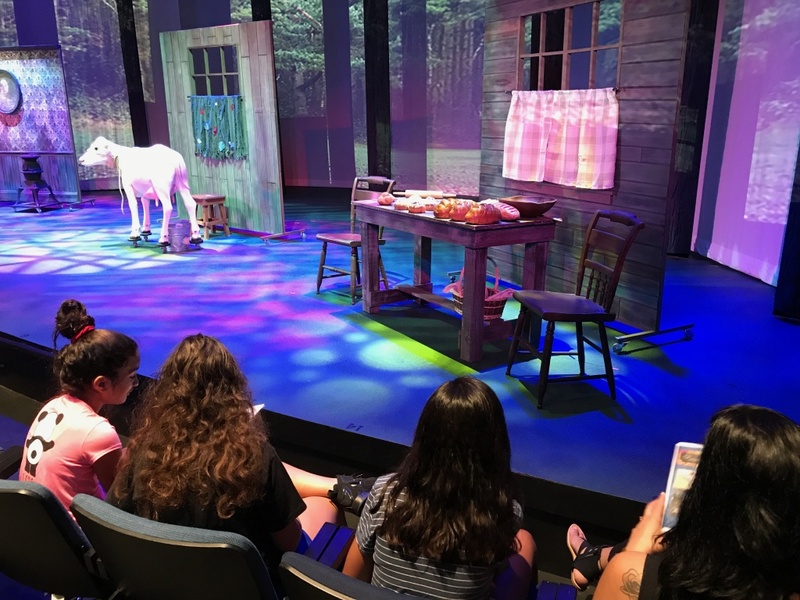 Some students got front-row seats to the musical where they were up-close to the moveable trees, moveable props, and even a cow on wheels! There were no “extras” to move props on stage and with only about 18-20 actors, actors moved the props. The props included 8 ceiling high trees on tracks which actors moved to form spaces. They also had two very tall towers (20 feet tall) that seemed to move very easily in place. One for Rapunzel, and one for Jack and the baker to wack the giant. There was even a cow on wheels! “Into the Woods”, directed by Bruce Lasner, was a very beautiful production with a talented cast, great scenery, and a live music. Actors were from FAU’s graduate program along with some veteran actors playing the storyteller and the part of the which. Some of the students favorite characters where little red riding hood played by Erin Williams, Jack, played by Trayven Call, and the bakers wife played by Jessica Eaton – all FAU grad students. The singing was outstanding with lots of vibrato and some operetic-like voices. Music was live with the music director playing piano and directing a trumpet player, percussion player, reed player, and violin. The musicians were located in behind the audience in glass rooms and there were big monitors in the back that allowed for actors to follow the conducting arms of the piano player. Everyone really enjoyed the outing. The stage, props, actors, and theater really gave Boca Middle drama students a up-close look at a very professional production. Since this is a yearly summer festival at FAU, this could be the start of a tradition of participation in the festival.